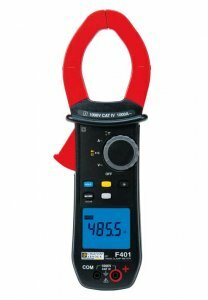 For medium and high-power work, the F400 Series provide maximum safety whatever the measurement conditions and type of installation. The F401 clamp is used on low-voltage, medium-power systems in LV electricity production and distribution, industry, railways, etc. It is also suitable for lift/elevator technicians and other lifting and transport equipment specialists. Maintenance, testing, monitoring, diagnostics and connection are the main applications for the clamps in this series. Automatic AC / DC detection is a standard feature on all the models in this range, as is IP54 protection. 0.15 to 1,000 A (1,500A peak). Volts AC: 0.15 to 1,000 V (1,400 V peak). Volts DC: 0.15 to 1,400 V.
True InRush (Overcurrent measurement): YES. Dimensions: 92 x 272 x 41 mm. Chauvin F401 Warranty: 1 year.